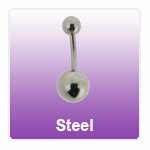 Our range of standard banana belly bars made from 316L Stainless Steel. We offer these bananabells in single or double jewelled format. All crystals used in these belly bars are from Swarovski. Most of the body jewellery is available in 6, 8, 10 ,12 and 14mm shaft lengths.